This is Lincoln. We adopted him 5 years ago when he was a kitten. It has been an adventure to say the least. I have never had a male cat so my knowledge is low on expectations but we have been pleasantly surprised by this fella. He was fostered in a family with dogs which explains why he is rather dog-like in some behaviors. He prefers to go outside for bathroom time rather than use his litter box. He comes when called and he will track you down and beg for attention. Such as he is doing here in this picture. December is a busy month and this guy has been feeling neglected. I was busy in the dining room working on some Christmas organizing when Lincoln gets comfortable in the highchair across from me. This was weird even for him but I kept on working away. There he was sitting watching me work looking like he was ready to help me out. He sat there for quite some time. That's impressive for any pet to be that patient and companion-able. 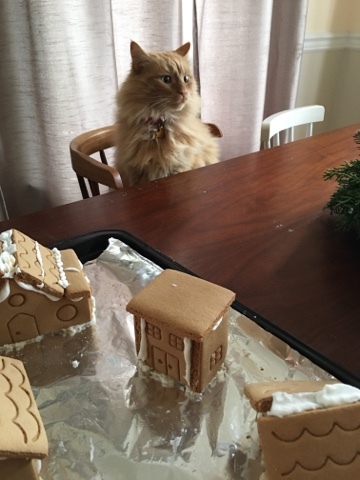 When I brought the gingerbread village to the table he became very interested. I should have assumed he was hungry by the way he was staring me down the whole time. Once I determined that his food bowl was empty I realized he was joining me at the dining room table for some non verbal communication. Still these pictures make me laugh at how perfectly he sat at the table. 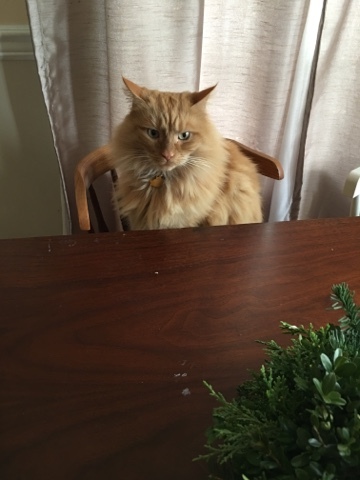 I imagined his thoughts to be something along the lines of him noticing his empty bowl and then deciding to sit at the table until someone brings him food because this is where the people sit to eat. So maybe he was thinking that because in the end he got what he wanted by having me refill his food bowl. This cat has a way of making life in our house so much more entertaining.